Yesterday I got a chance to observe some mothering and sibling rivalry. 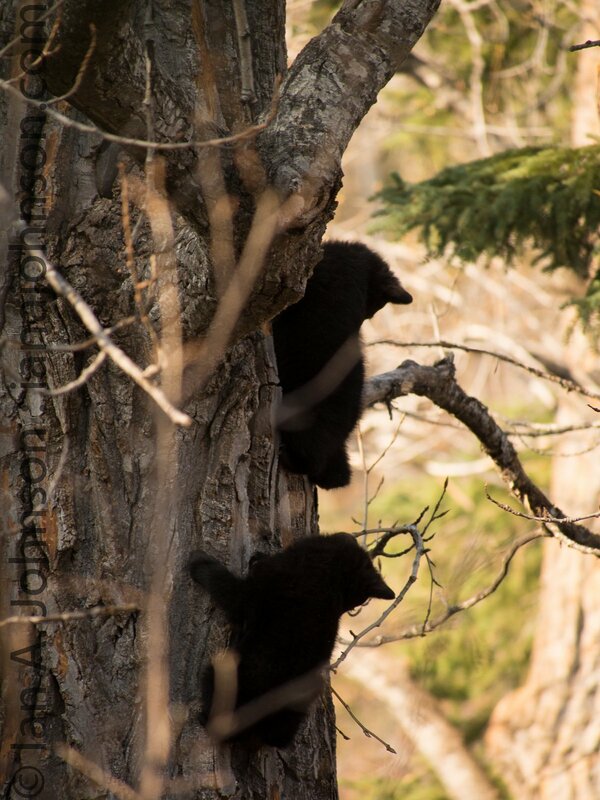 Bears in the Anchorage area have emerged, and mothers with new cubs are welcoming in the warm temps. Jonathan is filming bear behavior in the region for the BBC and needed a second man for that ‘just in case’ scenario that a bear became aggressive. Incredibly, Jonathan was able to find this sow bear and her two new cubs. Although you’ll see tags in the ears of this female, she has no tracking device – it was very lucky to find where she called home! As we came up to the tree area it was very important that Mom knew we were there. We talked and walked up to the site, pausing to ensure she had seen us. Once we were settled in she paid little attention to us. Momma bear hanging close to home and watching the frolicking cubs. The cubs were a constant source of entertainment. The would scramble along logs and tumble off them, fight each other in miniature mock battles, and pester their mother who would sometimes pester them back. 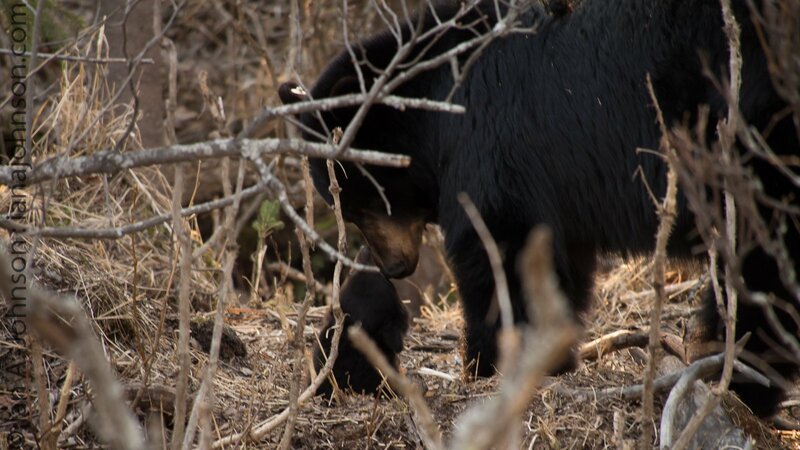 The bond between the bear cubs and the mother was evident – there certainly is some truth to that old adage! 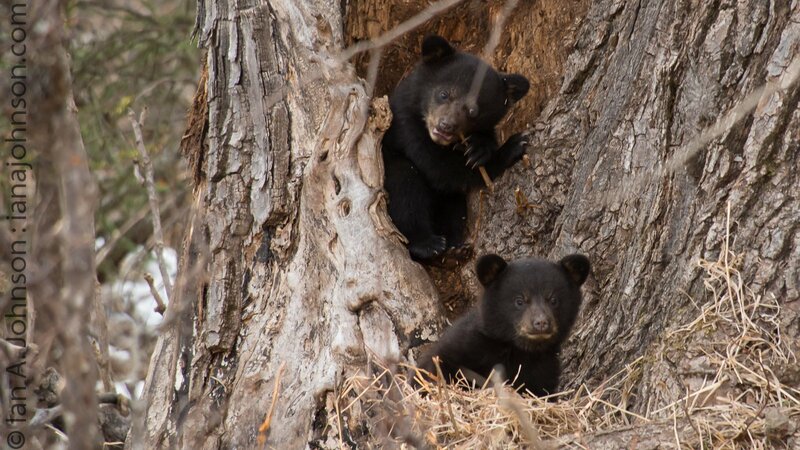 Two cubs playing ‘cub scouts’ up the tree trunk. The limb to the left of this cub was their favorite part. 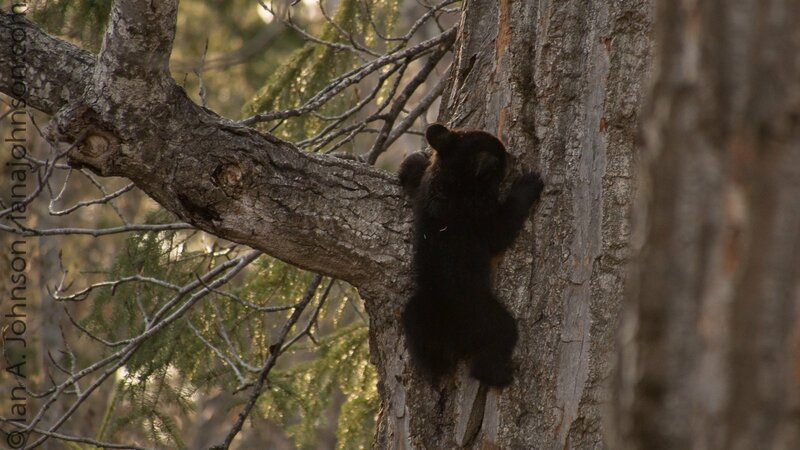 They would climb up to it, rest for a bit, and then shimmy back down the tree. A cute shot of the cubs. One trying out tree bark and the other checking me out. This cub looks deep in thought… wishing he was a bird? 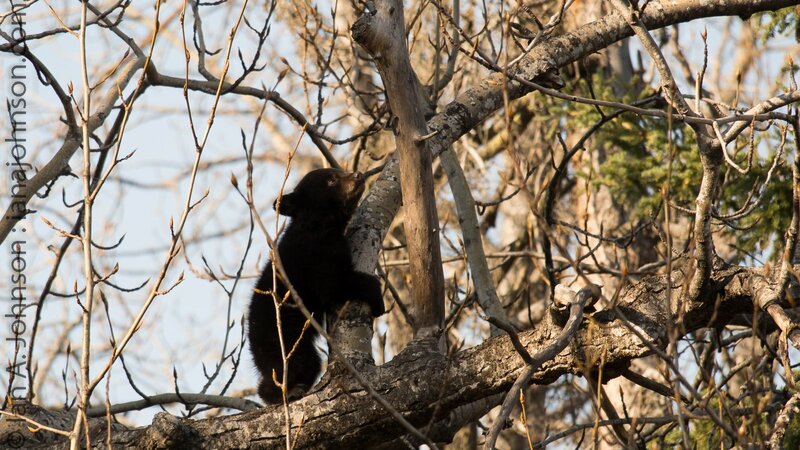 Through all of the cuteness there was still a stark reminder of the fragility of life as a small bear cub. These two were meant to have one more sibling. One cub was laying dead outside of the den, and Jonathan had seen it earlier. We experienced the mother eating the dead cub. I can assume this is for two reasons, the first is that she can use the protein. At this time the mother cannot leave the den and feeds little. 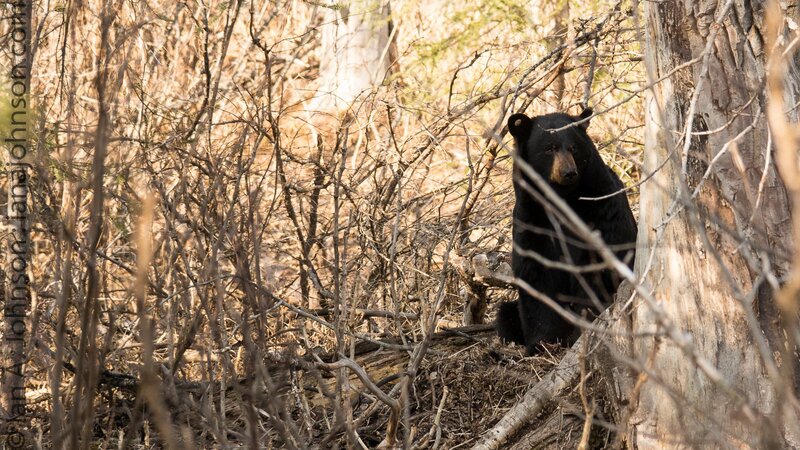 Second, the rotting body may attract predators or another bear and put her surviving cubs at risk. The mother ate the cub by tearing small chunks of flesh, even though it seems she could have swallowed it in one bite. 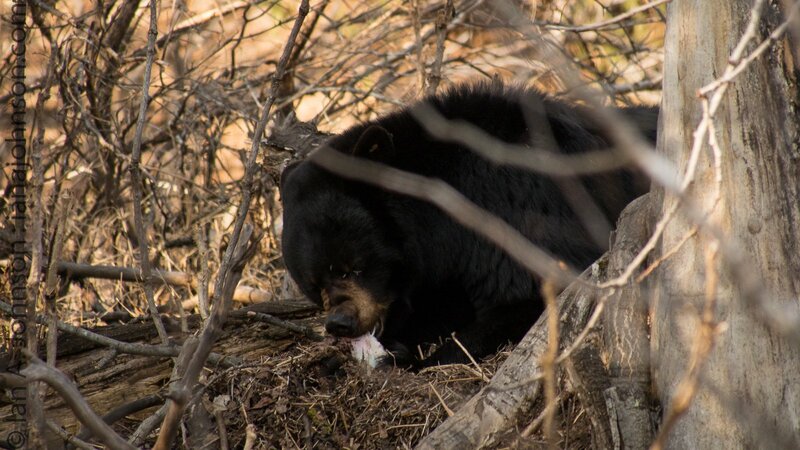 We experienced the mother bear eating the remains of her deceased third cub. Overall I do not know if I could experience more joy in watching wildlife. 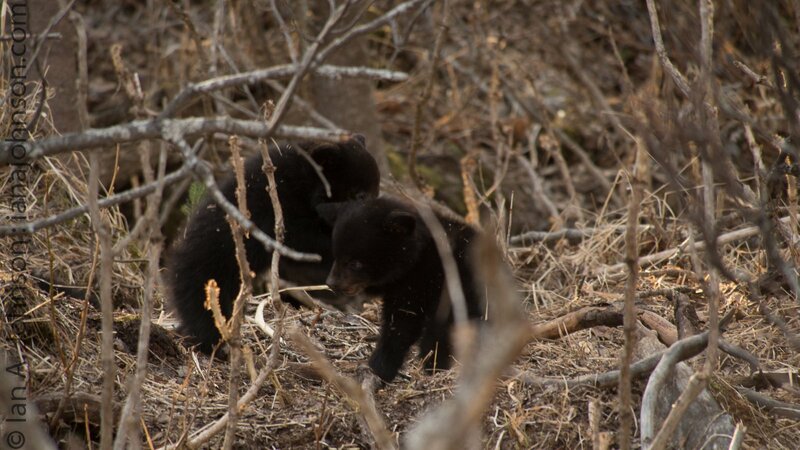 Watching these two cubs enjoy the spring weather, and the tenderness of the mother was endearing. I feel privileged to have experienced it! Momma bear and a cub touch noses.